“My uncle told me one time that she ruled with an iron fist,” says Young, raising her hand. “No smoking in the house. Do things her way.” In a lifetime of family letters, Lucy Stevenson comes across as strong-willed and independent. From Young’s mother, she had more of a picture of a close and caring grandmother who doted on her baby granddaughter. “In her aging years, my mother would say ‘Oh, I miss my grandma,’” she says. But Grandma Lucy was also a tempting mystery. “When I was growing up, I stayed a lot with my grandmother (Lucy’s daughter Willa),” says Young. “I would sneak upstairs and explore.” Finding crates and trunks, little Loralyn simply had to pry open the lids and peek inside. “I remember finding beautiful light lavender silk from a dress and lots of feathers, egret feathers, long beautiful and white, and long black ones.” She also found celluloid fruit, cherries and berries, black bird wings, and “all kinds of wonderful stuff.” But the explorations would come to a quick end when her grandmother would miss her and call her back downstairs. As the years passed, the trunks moved to Young’s mother’s home and then to her own. Besides letters, papers, and family tokens, there were the materials, the ribbons, buttons, the needlepoint, and the lace that seemed too precious to just throw away. 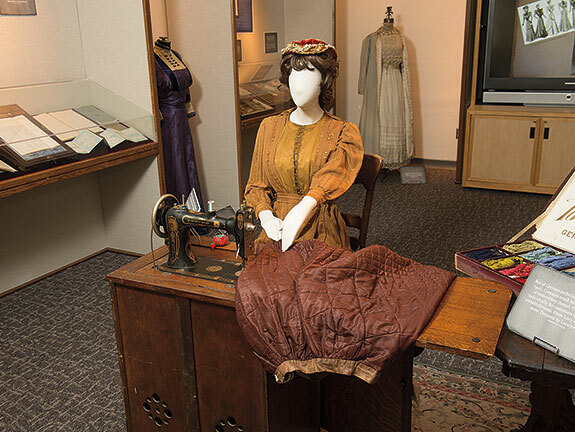 Young wondered, “What to do?” One day, she found the answer in a Washington State Magazine story about Washington State University’s costume and textile collection. She called curator Linda Bradley, who was somewhat intrigued by Young’s inheritance. “But when it showed up on campus, I was really excited,” says Bradley. The artifacts included a century-old German thread cabinet, a quilted petticoat, a sewing rocking chair, and goods for building hats. “Items that can provide a scenario of what life had been like,” says Bradley. It was a feast of fresh material for Bradley’s students, who were enrolled in a museum costume management course last spring. She had her own store, on property only in her name. Perhaps she learned something about owning property years earlier after her first husband died. 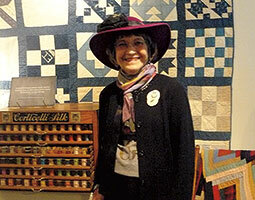 She also had tailoring and bookkeeping skills to use in supporting herself and managing her money. In the process of finding a home for Lucy’s things, Young herself learned more about her family and her community. And she provided a catalyst for WSU’s students to focus on a particular time in history. “I so much wanted the kids to parallel that economic and cultural time with our current time and culture, bank failures and all,” says Young. Last spring Bradley’s class on costume museum management blended items from Stevenson’s shop with pieces from the existing costume collection to create an exhibit exploring Lucy’s story and fashion and history at the turn of the last century.